One night I had a fabulous dinner party. I made a delectable herbed lamb roast, amazing veggies, desserts and more. But of all the dishes...this one was the winner. So sweet and savory and so good for you. Quick and easy too. Leftovers are great in a salad. Preheat oven to 375. Make an aluminum foil pouch by placing one sheet of foil in a horizontal direction and top with one in a veritcal direction. 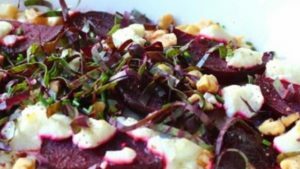 Place peeled and sliced beets onto the foil. Top with thyme, salt, pepper and oil and toss until well covered and distributed. Fold up the foil twitsting at the top to create a loose pouch. Open the pouch and place beets in desired bowl. Top with crumbled goat cheese, nuts and optional greens. Serve immediately.